7 Essential Lawn Care Tips to Get Ready for Summer - Keepin' It Green Inc.
1 Call our Office at (303) 424 1832 during office hours. 3 Use the Contact Us form on our contact page. 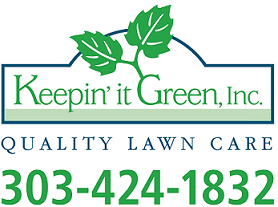 If you still have problems, please let us know, by sending an email to jim@keepinitgreeninc.com . Thank you! Warmer temperatures and longer days mean it’s almost time for outdoor living and entertaining. These lawn care tips ensure lush, beautiful yards that are ready for backyard barbecues and summer celebrations. For many homeowners, the first signs of spring weather trigger irresistible urges to start sprucing up their yards for summer. Unfortunately, disturbing the damp, soggy soil too soon may disrupt the growth of young seedlings. The ground needs warmth and plenty of sunlight to thaw and dry out, especially in areas that experience extremely cold, snowy winters. Once the ground hardens, new grass shoots are stronger and more stable. Leaves, fallen limbs, and other debris often accumulate outdoors when temperatures drop near or below freezing. As temperatures climb, debris such as these become breeding grounds for insects, pests, and diseases. Individuals who kick off the outdoor season with quick yard cleanups and thorough raking typically have healthier lawns in the summer. Raking removes thatch and overgrowth from the groundcover, and it gently separates new blades of grass to stimulate growth. Soil conditions vary depending on geographic location, recent weather, and the local environment. Areas that experience bitter winters typically have acidic soils, and the Southeast’s red clay often lacks essential nutrients needed for healthy plant growth. Store-bought tests provide a simple way for homeowners to measure pH levels, and lime is the best way to neutralize acidic soil. Lawn care professionals frequently offer detailed nutrient analyses as well as specially formulated soil amendments. Late spring is the season for planting. That’s when warm-season grasses, such as Bermuda and Zoysia, are growing. With cool-season varieties such as Bluegrass and Fescue, which flourish when seeded in the fall, spring is the best time to focus on weed control. Most consumer herbicides remain active for about 12 weeks and may damage new grass growth, so it is important that homeowners allow adequate time between applications and seeding. As soon as a newly seeded lawn develops a full, green appearance, it’s time to apply a quality fertilizer. For warm-season varieties, fertilizers are typically added in late spring or early summer. This is also the best time to start watering. Typical grasses need at least one inch of water each week during early growth phases, although exact amounts vary based on the climate. Homeowners who handle their own lawn maintenance tasks should service their outdoor equipment in early spring so they’re ready to get started in the summer. Sharpening or replacing mower blades each year is recommended for optimal performance. For best results, individuals should only reduce the blade height by about one-third during each mowing, and it is safe to start cutting the grass as soon as it starts growing. Aerating a lawn is a process that uses specialized equipment to loosen the soil to stimulate growth during the peak growing season. It is a task for early to mid-summer in yards with warm-season grass and a fall job for cool-season varieties. Especially hard soils may benefit from additional sessions. Do-it-yourself enthusiasts often prefer to rent an aerator from their local home improvement store, while others opt for the services of a lawn care professional. © 2008-2019 Keepin' It Green Inc. All Rights Reserved.